the education experts Bright World Education Ltd and Bright World Guardianships Ltd are sister companies and were established in 2000. Bright World Guardianships Ltd is dedicated to safeguarding the welfare of students while they are in the UK. 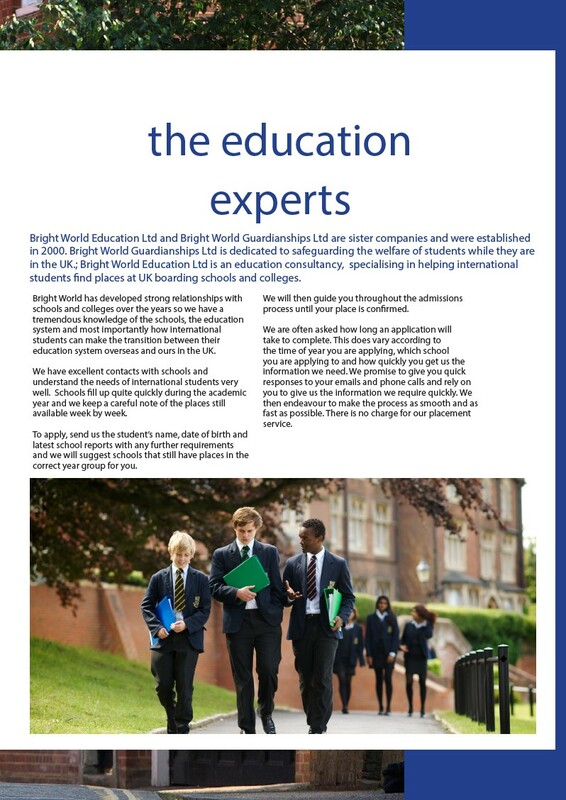 ; Bright World Education Ltd is an education consultancy, specialising in helping international students find places at UK boarding schools and colleges. Bright World has developed strong relationships with We will then guide you throughout the admissions schools and colleges over the years so we have a process until your place is confirmed. tremendous knowledge of the schools, the education system and most importantly how international We are often asked how long an application will students can make the transition between their take to complete. This does vary according to education system overseas and ours in the UK. the time of year you are applying, which school you are applying to and how quickly you get us the We have excellent contacts with schools and information we need. We promise to give you quick understand the needs of international students very responses to your emails and phone calls and rely on well. Schools fill up quite quickly during the academic you to give us the information we require quickly. We year and we keep a careful note of the places still then endeavour to make the process as smooth and as available week by week. fast as possible. There is no charge for our placement service. To apply, send us the student’s name, date of birth and latest school reports with any further requirements and we will suggest schools that still have places in the correct year group for you.